Brian Joseph Lambert is the lead contributing writer at Wingless Entertainment. He specializes in bringing diversity to action/adventure, fantasy and sci-fi worlds. In 2017, while earning his Bachelor of Fine Arts in Creative Writing at Full Sail University, his first novel, ASCENSION- THE CHRUSION SAGA BOOK 1 was published. While working towards his Master's degree in Entertainment Business, Brian's current projects include WAR FOR THE SWORD- THE CHRUSION SAGA BOOK 2, a CG animated feature film entitled, RUBICON and JUSTICE- THE FALL, an ongoing graphic novel, in cooperation with KONKRET COMICS. Brian looks to create the same sense of wonder he had watching Star Wars, reading Lord of the Rings and questing alongside the many adventure stories he enjoyed. Michael and Kyle were brothers in both arms and blood, but any in the Black Knights would stand side by side, shoulder to shoulder. They would put their lives into the hands of their fellow guild members without question. Experience from the twenty-year war had taught many lessons, ones the other guilds serving the king of Avalon did not always understand. As such, they were the only ones Shawn could trust at his back on a mission of grave importance. When a rumor from the Count of Lyoness whispered of the King's Warriors inciting war with heinous, unspeakable acts, there was a choice to be made; peace or war. One thing is clear, someone attacked protected villages. Someone seeking to implicate Avalon is behind these attacks. The question is who, and what are their motives? Ascension by Brian Lambert makes for an entertaining read. Many readers may find the segregation into only nine chapters an unusual choice, but fear not, within each are scene breaks that can act as a good place to stop when you need to put it down. The attention to hierarchy and guilds will put people in mind of the detail paid to such things in Game of Thrones. Realistic relationships make for not only conflict within the Black Knights, but their tightly knit relationships mean they can overlook such things to stand beside their brothers in arms as needed. A detailed and descriptive style of writing provides vivid and clear descriptions of places, people, and things to create clear imagery of the lands and its people, adding to the world building undertaken. An amalgamation of action, adventure, challenges, tension, drama, faith, honor, revenge, legacies, and justice fill the pages of this gripping journey and provide an exciting foundation and foothold for the next book in The Chrusion Saga. Ascension is a work of action and adventure fiction by author Brian Lambert, and is the first book of The Chrusion Saga. Set in a different world to our own, Chrusion is a place where technology and the old ways of the feudal system unite, producing modern chariots and weaponry but with the old code of chivalry and the unity of knights in armor. The dangerous and bloodstained Black Knights are one such unified group, and an apparent mutiny within their own ranks sends them reeling even on their own turf. As they struggle to unravel the betrayal and fend off their outside enemies, a powerful battle looms on the horizon. Brian Lambert has successfully mixed the beauty of the traditional historical fiction novel with the suspense and all out thrills of the modern day action blockbuster, culminating in a rich, immersive and also highly exciting reading experience. Each of the knights featured is his own well developed creation, human and vulnerable despite the violence and incredible power they portray. Though the violence is strongly depicted on the page, the real impact for me was made by the detailed creation of Chrusion itself and the ways of life of the people. Heraldry and colour pop from the walls of this world, constantly forcing you to recognize the powerful divisions of loyalty so that when it comes to battle, you are as loyal to your knights as they are to each other. Overall, Ascension: The Chrusion Saga Book 1 is a gripping start to what will no doubt become a very successful action saga. Ascension is the first book in The Chrusion Saga by Brian Lambert, a mesmerizing tale with mythological hints, a strong conflict, and a world that reflects values of the Arthurian era. Tension is growing between Avalon and Lyoness while the Black Knights are on a campaign of vengeance. When rumor from the Count of Lyoness indicates that the King’s Warriors are committing acts that could lead to war, it becomes clear that someone wants to get Avalon into a messy situation. But who is it? The Black Knights must find out who has betrayed them, and they are running out of time. Ascension is written in a beautiful style, with prose that is enjoyable and plot points that hold the reader’s attention. The novel features powerful characters and a world with its own rules. Readers will enjoy characters like Michael and Kyle and the bond between them, brothers who fight for the guild and whose patriotism is unparalleled. There is so much beauty in this story and Brian Lambert creates a world that readers will love to navigate, with vivid descriptions from small details like the décor of significant places, to the actions in battle. The use of the epistolary style greets the reader from the opening pages, with Shawn's exchanges with his mother. One has the impression that two worlds merge in this narrative — the communication is modern, but the setting and the culture within which the story takes place is ancient. The story features exciting dialogues, a strong conflict, and characters that are unforgettable. It’s a huge promise for the start of a series and one reads this book longing for what comes next. 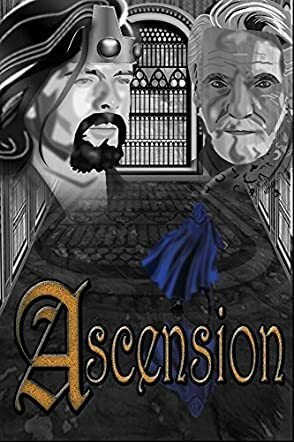 Ascension is the first book in The Chrusion Saga by Brian Lambert, a novel that takes readers into the legendary settings of Avalon and Lyonesse without sacrificing contemporary reality, a world of kings and knights and intense regal drama. This is a tale of valor, loyalty, and betrayal that follows the Black Knights who serve the King of Avalon. Now, someone has betrayed the guild and war is about to erupt between Avalon and Lyonesse. The Non-Aggression Pact is a sacred one and has consolidated the peace between the powerful kingdoms for many years. Now, someone is setting Avalon against Lyonesse, and war with Lyonesse would be violating the sacred pact of peace. Can the warriors of the guild find the traitor before it's too late? While the drama is intense and the characters compelling, one of the strong merits of Ascension is the realism that permeates every layer of the story. From the very first page, when we meet Shawn, it is hard not to feel the pain in his soul as he sweats, holding a letter that is wet with tears and rain; the reader knows something tragic is about to happen and they wish they knew what it was. The emotion is real, the description of his gait and insights into his thoughts are done with unusual clarity, and this aspect of the writing is present in every page of the narrative. Characters like Michael and Kyle and the bonds they share with other members of the guild will fascinate readers. The drama makes the story very interesting and engaging. The dialogues are real and they deepen character development, explore themes, and move the story forward. Brian Lambert has a strong narrative voice and comes across as an expert in the art of suspense, and he uses it to keep the reader engaged. The plot is tight with scenes that are focused and a conflict that keeps the reader's eyes fixed on the pages. This novel has a lot to offer readers. Lambert creates characters that readers will love to stick with. Welcome to the world of Chrusion. It's a world like our own with a similar history, but more like a fantasy equivalent of modern reality. The Black Knights, led by Michael, find themselves summoned by the king of Avalon to avert acts in violation of the non-aggression pact made at the close of a 20-year war that ravaged three kingdoms. Unfortunately, pacts don't rest easily, and the victors always face further challenges with their adversaries building themselves up. When Michael takes several of his knights on a secret mission to avert acts of further aggression, they discover more treason and plots that rival modern day political thrillers. Soon, Michael and the brothers of his knighthood must fight not only for peace, but to unravel a complex plot that threatens to plunge the entire world back into a bloody war. Ascension: The Chrusion Saga, Book 1 by Brian Lambert is an epic fantasy tale set in modern times that weaves past and present into a thrilling ride right until the last page. I did enjoy Ascension. Brian Lambert has an impeccable sense of writing epic battle scenes with plenty of action and description, which is less common in modern story telling but a "must" when weaving a fantasy tale such as this. Michael, Kyle, and the other knights are also great characters. They form a bond of brotherhood and loyalty that both encourages friendship and sparks conflict throughout this epic tale of a once benevolent throne that's grown cold with desires for revenge and power. It's been a long time since I've read a fantasy novel, and I especially like how this one takes a unique slant by incorporating the modern world and technology with more historical senses that you typically see in fantasy. Altogether, a unique tale that you'll be sure to enjoy to the very end.